There’s something about the dance community that I have yet to observe anywhere else. I have a theory that dancers tend to reside in this space where brilliance and insanity overlap just a bit, resulting in something fantastic that I can’t quite put words to. But within that space we find a certain understanding that I like to think is reserved only for people who share this dancer connection, and it’s that little something th at makes us do things like willingly sign up to spend 30 hours a week for a month beating ourselves and others up for the sake of the love of movement and an appetite for growth. 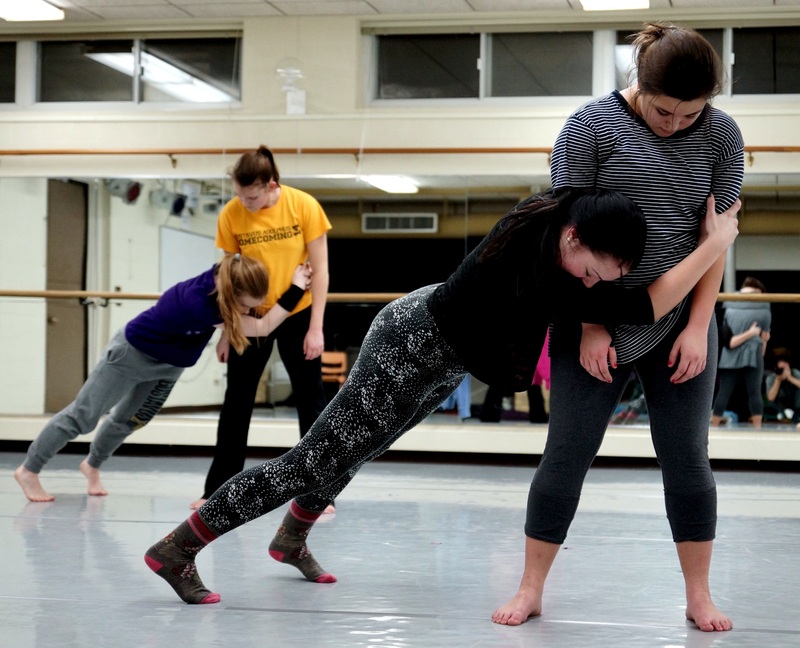 So when we arrived on the first day of our J-Term class “La Gringa Danza,” taught by Melissa Herrada and Jordan Klitzke ’10, the 16 of us expected to grow and learn, but aside from that, we were essentially clueless. When you sign up for a month long dance intensive, it’s pretty much impossible to know what you’re getting yourself into, so we all chatted nervously and glanced around the room, wondering what the next 130 or so hours spent together in this place would bring. Melissa introduced us to Continuum technique during the first part of the first class and her initial movement resulted in the exchange of wide-eyed glances and comments like, “She moves like water” among the class. After the first awkward hour of trying to wrap our minds around how Melissa could move across the floor as though her body had no structure, we moved on to center work and five minutes later her small frame had no trouble lifting her much larger counterpart, Jordan. We were officially amazed. Class from then on wasn’t so different. We usually started the day with aching muscles and ended it incredibly tired, but with the fullest of hearts – always amazed. We normally spent the first part of class working on Continuum technique with Melissa. Continuum is rooted in Latin American culture, brought to Gustavus by Melissa and Jordan who both studied at Escuela Profesional de Danza de Mazatlán in Mexico. The technique starts on the floor and gradually works up to standing, integrating the floor technique into more advanced combinations and concepts. As the name suggests, Continuum focuses on continuous movement and the body’s natural pathways through space. It’s incredible to watch, difficult to untangle in your brain, but it feels like home in your body when you find the rhythm. The focus on efficiency of movement is part of what makes Continuum movement so intriguing to a viewer – particularly to many dancers who, like me, have attempted to achieve a seamless aesthetic through extensive rehearsal instead of by finding logical, fluid routes in the body. Transitions aren’t just important in Continuum technique – transitions are Continuum technique. For me, Continuum technique finds efficiency in the same way our bodies can naturally find efficiency in our daily actions or in improvisation. The middle section of class was led by Jordan and consisted of structured improvisation, conditioning, partnering, and other helpful exercises to build upon our Continuum training. Another focus was building our group unity, a particularly important aspect in developing our piece, which we worked on during the third section of class each day. The construction of the piece utilized the physical and mental aspects of class, demanding creativity, physicality, and the performance skills to bring it all together. Those long hours together brought bruises, confusion, and frustration, but they also brought progress, strength, and unity. Together, we conquered the fear of something completely foreign to us that each one of us will now be able to bring with us and keep in our bodies – but also keep in our hearts – for the rest of our lives. The beauty of the technique is that although it is a specific training process with a structure, the movement quality can be applied in many other styles of dance. The concepts of Continuum open your mind to thinking differently about movement in general, which can add a richness and depth to any other style of dance. The most beautiful part of the month-long experience for me was the extreme diversity of background that the class brought together. There were lifetime dancers and those just beginning their dance journey, succeeding and failing alongside each other. Continuum placed us all back on square one, and we all moved forward together from there, inspired by Melissa and Jordan, who brought energy to the classroom and encouraged us to all to take risks, be bolder, and to (sometimes literally) jump right in. Melissa, who was born in Mexico, and Jordan, who picked up Spanish as an adult, communicated with each other and with the class through a mixture of English and Spanish explanation and translation, punctuated by a lot of elaborate gestures from Melissa, who often wanted to get points across that the English language just doesn’t have words to describe. Because of this, we asked questions, understood from a different point of view, and made connections that went beyond our usual linguistic form of understanding. In all, I witnessed dance doing what it always does best – transcending boundaries of language, culture, and training. We began as a group of people, each searching for different things – a challenge, an introduction, an opportunity, or maybe a break from the usual academic structure, but whatever the initial intention, we each ended with a more thorough understanding of ourselves, each other, and of the art of movement that we love so much. The full days of class and rehearsal are now over, and for many of us, it will not be an experience that we are so lucky to have again, but with us we take a lesson that goes far beyond my favorite world of dance: We may be bruised and sore, but we are strong.